Very well kept with beautiful scenery just be cautious if you are going with kids as not every part is fenced. This place is truly amazing and try to stop in Rastoke before it is a charming little paradise. A fantastic day out with Ivana and Marco our guide and our driver, We enjoyed the history and seeing the war museum on the way. A lovely stop for refreshment at the village of Rastoke. Very pretty and Ivana directed us to all of the best photo spots. Our walk around the lakes was with our consultation and the expertise of Ivana and was tailored to our requirements both physically and photographically. Very well organised. Comfortable vehicle and Marco always kept it cool for our return from our activities. I would definitely recommend this tour and the small group option so that you have a tailored tour. Great day, even though we werent up for the full walk around both lakes. Eva, our guide, was wonderful! She was flexible, tailoring the day to our needs. However, when we told her that we werent really up for a wartime museum, expecting rifles under dusty glass, she gently convinced us that a brief stop there would be worth it. She was right! Learning about the do-it-yourself approach to defending Croatia during the Homeland War with homemade tanks was fascinating and touching. She then took us to Rastoke, a beautiful village built over several waterfalls. That was only an appetizer to what was to come the Plitvice Lakes. Words cannot express their pristine beauty. They honestly dont look real. Our foursomes age range was 40-80, and there were moments for all of us where we found the hike challenging. Much of the hike is made up of walking over wooden slats of various heights over water, with no handrails. It took enormous concentration to place our feet safely with each step, while avoiding the many other people on the walkways trying to move ahead, all while being bombarded with so much beauty it was hard to take it all in. There were also many steps up and down steep inclines along the way. While Eva told us that she had taken a 97-year-old and a man on crutches around the Lakes, we knew our limits! We were mentally and physically wrung out after going around just one of the 16 lakes, but it was absolutely worth it! You will never see such beauty anywhere else! Thank you, Eva and Marco, for a day we will never forget! If you are going to Croatia, do not miss going to the lakes, absolutely beautiful. So glad we picked the private tour since we had a late night flight to Split. Our guide made our visit to such a beautiful place easy. Knowing we had a limited time to see it all he made sure we didn’t miss a thing. Definitely made the right choice in picking Viator for this amazing tour. I highly recommend this tour. Our guide Hrvoje was punctual, courteous, professional and very knowledgeable. 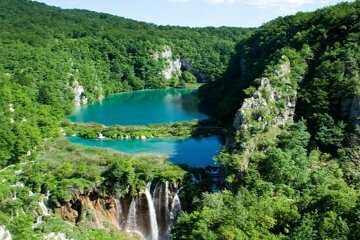 We able to see the stunning highlights of the Plitvice Lakes National Park at our own pace with his informative commentary. We are so glad that we chose this tour as we would not have been able to fully appreciate the Park on our own. Not to be missed!! I would highly recommend this private tour - my friend and I thoroughly enjoyed the day. Informative, fun and worth every penny. Fantastic guide. Gorgeous lakes, clear blue-green waters, quiet due to low October crowds - we enjoyed our tour of Plitvice lakes a lot. This is a place worth going to - but be warned, it's hugely popular - avoid the high season - it's not so big that you can lose yourself and enjoy the sheer beauty of nature here when it gets really crowded - but you can catch a some nice quiet moments by yourself walking by the lakes in the off-season. Timing is critical when you plan this visit. I'd say June to August would be very crowded - Sept would be better - even better October or November - because it's still quite pleasant and warmish in Oct and early Nov.
An amazing experience. We stopped in Zagreb only for this tour, and it was worth every penny, thanks to a lovely lady, our guide, Ms Ivana Srebocan. She was not only knowledgeable and professional, but was very helpful in making our trip memorable. She came up with good advices, especially because of my wife having walking problems and dietary restrictions. She showed us all the relevant places with the least amount of taxation, physically. Helped us in finding a lovely restaurant for lunch. Worth the visit, many tomes over. Thanks Zico tours and a big one to Ms Ivana.